One of the prime features of the Freestyle Edge Gaming keyboard is the SmartSet application. The application itself is not particularly flexible and/or feature-packed, but there is one particular thing that it makes it very unique: it is a portable application that is stored inside the keyboard’s memory. To access it, the user has to press and hold the SmartSet button, then press F8. This keystroke combination will connect the “vDrive” to the system, which essentially is a small flash memory module that is inside the keyboard. The system reacts just as if a USB flash disk has been connected to it and will pop a new drive folder that includes the SmartSet application, the keyboard’s settings/firmware files, and the full user’s manual. 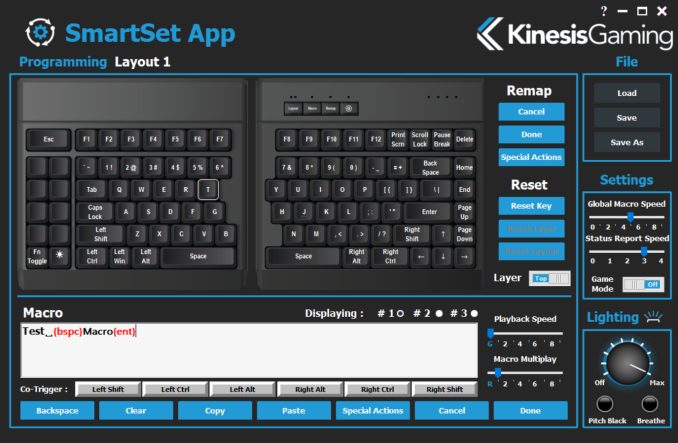 The SmartSet application runs directly from the included flash memory, no installation is needed. This gives the Freestyle Edge keyboard a very distinct advantage, as nothing is being stored in the OS/system - any and all programmed changes are stored directly in the keyboard’s flash memory and follow the keyboard. Any profile/layout changes are bound to the keyboard and it will not matter if the keyboard is connected to another PC, not even the OS that the other PC may be running. 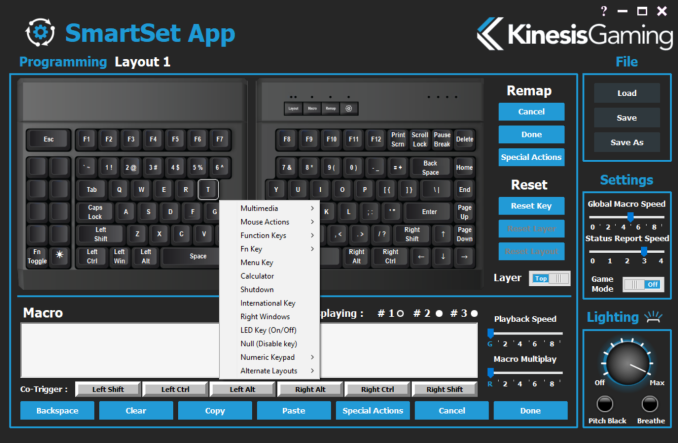 The SmartSet application is currently compatible with Windows and Mac only, but any changes already made to the keyboard’s settings appear to be functioning under Linux and Android as well. The SmartSet application is relatively simple. It is a single-page configuration screen that allows the user to reprogram any key, on both the top and the Fn layer, of the currently active Layout. The keyboard supports up to nine layouts, all with two layers each. Advanced programming capabilities are relatively limited. For example, the user can use multimedia functions, such as volume and playback controls, access special characters, and launch basic system applications, such as the calculator. Advanced commands, such as launching specific applications, are not available. This feature could cause issues, considering that the command would be stored in the keyboard and the external application to be launched would be installed into a specific system. Mouse clicks also are available, but mouse movements commands are not. The Macro recorder is quite basic and virtually limited to simple keystroke combinations. Advanced commands, such as mouse movements, cannot be programmed into the macro command. This may be a problem for users who need to use complex macros, as it is not possible to call upon external executable files either, so using third-party applications to compile executable macro files will not help. On the upside, the unique firmware of the Freestyle Edge allows it to store up to three macros per key. Each of the programmed macros can be assigned a “trigger” key, which is one of the Shift, Alt, or Ctrl keys. It is possible to store up to three different macros into any single key, as long as they use a different trigger. "This will just not work for people who need to be using more than one keyboard during the day. Perhaps someone who is using the Freestyle Edge alongside with a typical keyboard for weeks in parallel can get used to using both of them at the same time, but that will undoubtedly take several weeks of training." I also have an Advantage2 never saw any major "portability" problems. The anger management lessons thing made this review for me.